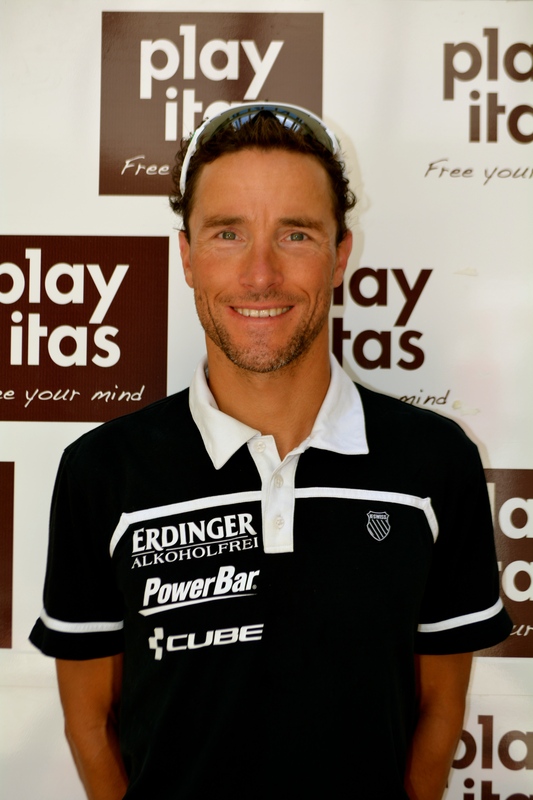 Andy Raelert has been training in Fuerteventura on the way to Kona. The German triathlete participated twice in the Olympics – 2000 and 2004 and has a vast collection of titles such as the world record at Challenge Roth, the Ironman European Championship and 3 times winner of the ‘Triathlete of the Year’ award. Andy gave us an interview between training sessions and we had the opportunity to get to know him. Why did you start triathlon? In 1992 when I saw a documentary about the Ironman World Championship in Kona and I was very fascinated to see the pictures about triathlon and then I decided when I was 16 years old (1993) to do it, so I did my first triathlon and I got addicted. What’s the secret of Raelert brothers’ success? Easy! :-) We train mostly together. Triathlon is a very individual sport but to improve yourself you need a worldclass group. If your brother is on a world class level we can push each other and sharing special moments, the good and the bad ones.That’s the way we enjoy triathlon. Playitas Resort attended to Ironman Klagenfurt 2013 and we have to say your arrival was absolutely amazing. What did you feel when you arrived to the finish line as first triathlete? Happy because my goal was to managed under 8 hours. I did it twice, not only in Klagenfurt, eight years ago in Roth I did it too but crossing the finish line is very emotional. That’s the reason triathlon is also so popular, the professional athletes and the age groups athletes are racing the same race which it’s really unique worldwide. In triathlon everybody gets though the same moments, it’s like a rollercoaster even the winner is not having a smooth day everybody is only cheering for you. The only difference between professional and age group triathletes is just the time at the finish line. You have the feeling that everybody is just cheering for you and this moment is very very special. You are very proud you made it. You are actually 38 and getting better as old wine. Where is your limit? I’m not sure! In triathlon, especially on the long distance triathlon, experience is what you need. If you go through on the single datas, in terms on speed, output on the bike and mileage for the run it’s all about experience. I’m not old enough to quit and I hope for still 3 more years to be at the top level. Who is the most powerful of you brothers – Michael or Andreas? Michael, unfortunately, has more talent that I have. He just have to be more patient. To be a world class athlete you have to be good at all three -swim, bike and run- We are brothers but with different characters. He’s younger but he needs to be patient. Sometimes Michael wants to go with his head through the wall and sometimes it works and sometimes not. How long before do you travel to a race? It depends. If it comes to a very important race for me then I’d like to be at the destination a week before. If it is oversees with a different time zone then I travel 2 weeks before the race. I think the right question would be: is there a country I haven’t travelled to? Yes, for sure I get around quiet a lot and it’s great to see all the different countries and nations with different cultures. Do you have much time to visit them or just for the race? I’m not on a vacation trip as a professional. So I don’t see that much as you can see if you are on a holiday but if you are on a training camp or longer you try to get around and you see a lot, if you are focused on the race you don’t see much, but when your mind is free you can see a lot. Never lose the passion, never forget what you want and really enjoy it! Why do you choose Playitas for training? Playitas is a very unique place worldwide. I’m looking for the best facilities where I can train and at Playitas you have a perfect pool for swimming, great weather all year long, good roads for cycling, low traffic and some nice training trails around the resort. The staff are very helpful and focused on training as well as providing everything a professional athlete requires, the food is also of a high standard for professional athletes. What can you tell us about Fuerteventura? How many hours do you train a week? On a good day three, on a bad day none of these. Great area, great club, great staff who takes care of the athletes and I will be back in November and hopefully next year. Thank you Andy and never lose your smile!